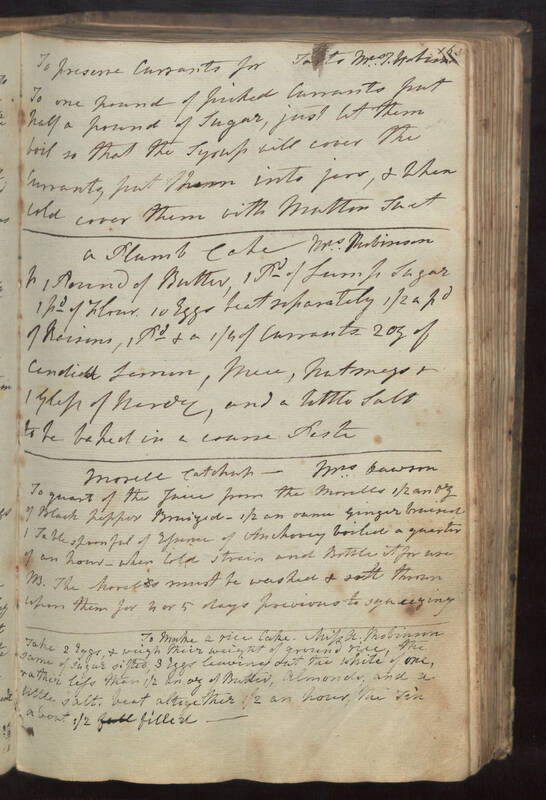 To preserve Currants for Tarts Mrs T.[Hobison?] To one pound of picked currants put half a pound of sugar, just let them boil so that the syrup will cover the currants, put them into jars, & when cold cover them with mutton suet A Plumb Cake Mrs. Robinson [illegible] 1 pound of Butter, 1 pd of lump sugar 1 pd of Flour 10 Eggs beat separately 1/2 a pd of Raisins, 1 pd & a 1/4 of currants 2 oz of candied lemon, mace, nutmegs & 1 glass of brandy, and a little salt to be baked in a coarse paste [Morell?] Catchup Mrs Dawson To quart of the juice from the [morells?] 1/2 an oz of Black pepper Bruized. 1/2 an ounce ginger bruised 1 tablespoonful of essence of anchovey boiled a quarter of an hour. when cold strain and bottle it for use NB. the [morells?] must be washed & salt thrown upon them for 4 or 5 days previous to squeezing To Make a rice cake - Miss A. Robinson Take 2 eggs, & weigh their weight of ground rice, the same of sugar sifted, 3 eggs leaving out the white of one, rather less than 1/2 an oz of Butter, almonds, and a little salt. beat altogether 1/2 an hour, the tin about 1/2 filled.